A graphic showing the number of homicides both solved and unsolved since 1976 via the Murder Accountability Project. As politicians are pushing for action for missing or murdered indigenous women or girl cases, often referred to as MMIWG cases, more than 26 percent of cases of homicide involving Native women since 1976 in Arizona have gone unsolved, according to FBI crime data. The analysis was made possible by the Murder Accountability Project, a non-profit created by former journalist Thomas Hargrove to analyze murders across the United States. The project has gained widespread attention for showcasing poor clearance rates on murder by police departments and finding clusters that could be associated with active serial killers by analyzing crime data reported to the FBI. By using MAP’s data analysis tools, it shows that in Arizona, 26 percent of all cases of murder involving Native women have gone unsolved since 1976. There are 42 unsolved cases in total, with the worst year for unsolved Native murders being in 2003 when 4 cases went unsolved. The data also shows an interesting trend in the number of cases, with a sharp increase from 2015 to 2017. During that three year time frame there were 29 MMIWG cases, 6 of which went unsolved. That’s more MMIWG cases than the previous 9 years combined. However, there was another minority group that did not fare much better. Approximately 30 percent of cases of murder involving black women in Arizona from 1976 to 2017 went unsolved, a total of 104 cases. Overall, there are more than 700 unsolved murder cases involving women in Arizona, according to the data. However, when it comes to reporting on Native deaths there is an issue when it comes to the data. As researchers with the Urban Indian Health Institute pointed out in a study last year, many agencies that report crime data to the FBI are not doing so properly. The Santa Fe Police Department told UIHI researchers last year that they could not separate Native women from their own data sets. Additionally, race is generally not determined by the medical examiner’s office and is determined by whoever is issuing the death certificate. It’s unclear what are the exact limitations of the data for Arizona. This point is further noticed when one begins to try to analyze overall homicide clearance rates for many of the tribal police using MAP’s tool. 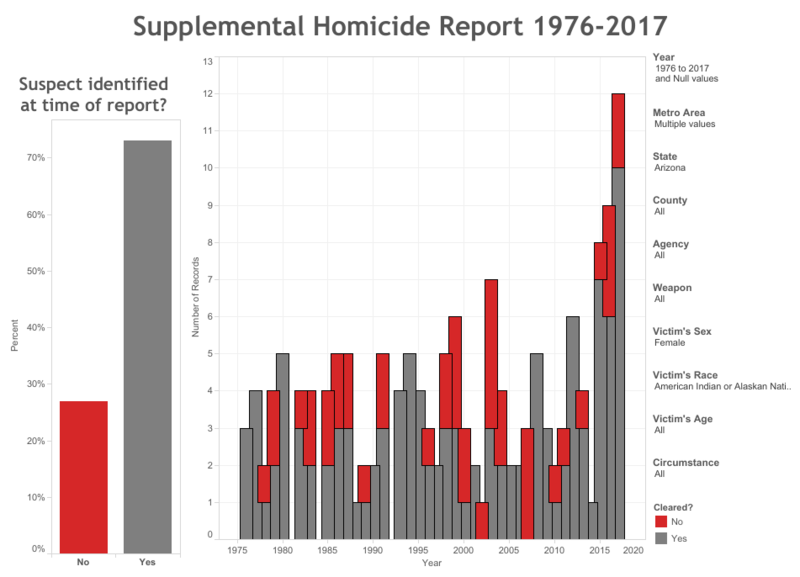 The Ak-Chin Tribal Police have one homicide in the FBI records which has not been cleared and the Tohono O’odham Police reported 33 murders from 2006 to 2016 but solved only 2 of them, the data shows. The Fort Apache Police Agency reported 91 homicides from 2006 to 2016 and solved only one. Another cluster of suspicious murders involving a hammer were identified by researchers in Pinal County that included a Native woman and a woman of an “unknown” race. Despite Hargrove’s dataset being the most complete collection of murders in the United States, it does have flaws. All this data is based on FBI crime data which is voluntarily submitted by departments and has been found to have flaws so it is unclear what the real numbers of unsolved MMIWG cases are in Arizona.